Clothing is not an “investment” no matter what the fashion people tell you. It’s an ephemeral statement which explodes into angst and clutter. This nugget of gold was posted on Ravelry in discussion about minimalist wardrobe and how to get one. It is so true, at least for me. My clothing is definitely a statement, even though it hasn't exploded into angst (I like all my stuff and black goes with everything, especially black), it has exploded into clutter. The above t-shirt is my absolute fave, worn so much and washed so many times it is not black any more. 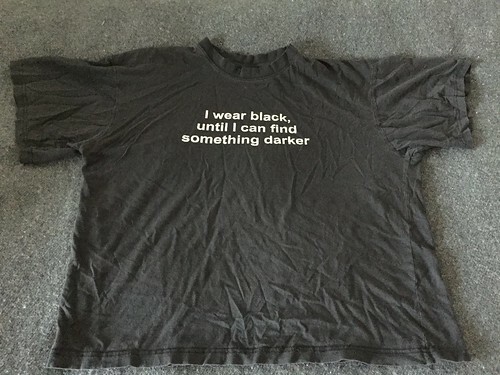 It's not black, I haven't worn it in years, but I still could not part with it, it is so me. I love black and will keep on wearing it until I love it no more or find something darker. All the discussions about minimalist wardrobes, purging stuff no longer loved or fitting or wearable, inspired me to do a spring cleaning in my wardrobe and finally parting with that shirt among others. I have the photo to remind me of it, I do not need the physical item to have the memories. I have been feeling like I needed to change my style for a while and finding http://into-mind.com/ via Roobedoo gave me the tools to build my new one. Her posts about signature look were especially interesting and helpful. It turns out that I already have what she calls an uniform. Black wide cargo trousers, black T-shirts, black jackets, black or red footwear, colourful wool socks in the winter and random colour accessories. I am very comfortable with the black, not so much with the random colours of socks or other accessories. I also have been re-defining my uniform. First, I decided that I'll keep black as the main colour, but I'll simplify the accessories to one colour family — red. So, footwear shall be red (darker in the winter, brighter in the summer), wool socks shall be red, cotton knee-highs shall be black (could have red as secondary colour), gloves, mitts and headgear shall be red (darker in the winter, brighter in the spring/autumn), scarves in black (could have red accents). After sorting out the accessories I pondered over the rest and decided to start sewing my own clothes again. The most important reasons were that I'm too big for off the rack trousers in the style and material* I want, and those trousers that I fit in are of very poor quality, so they never last for as long as they should for the price I pay for them. Secondary reason is that the selection has also gone down and I'm on my 4th and 3rd pair of the two wearable models. How boring is that? Last time I went trouser shopping I managed to find a pair in another model that fit (barely), but it doesn't have enough pockets. So, yay? I now have three pairs of trousers I can rotate and hope they last a little longer. I figured that I can sew my own to get them in the right size, make them better quality so they last, don't shrink every time I wash them, and get the exact number of pockets in places I want. Once I've figured out two or three basic patterns, I can start playing with the details and get some variation that way. This is why I've been knitting almost exclusively red things (or black things with red) lately and going on and on about wide trousers. The style is taking shape and so far I am pleased with the look. It feels right. * I hate wearing synthetic materials. I disliked them before studying medieval clothing for them being so uncomfortable, but after I discovered how awesome the combination of linen and wool is in most conditions, I try to exclude synthetics and man-made fibres from my modern wardrobe too. That greatly reduces the available clothing to buy and I've had to make compromises with winter jackets and such.